Get your Cinnabar and Rose-of-Sharon here! Sadly, the Magknits site has been abruptly shut down; I will always be grateful to them for the chance to showcase several of my early designs to a wide web audience, and it's unfortunate that the same opportunity won't be available to other new designers--nor the library of free patterns to all knitters. 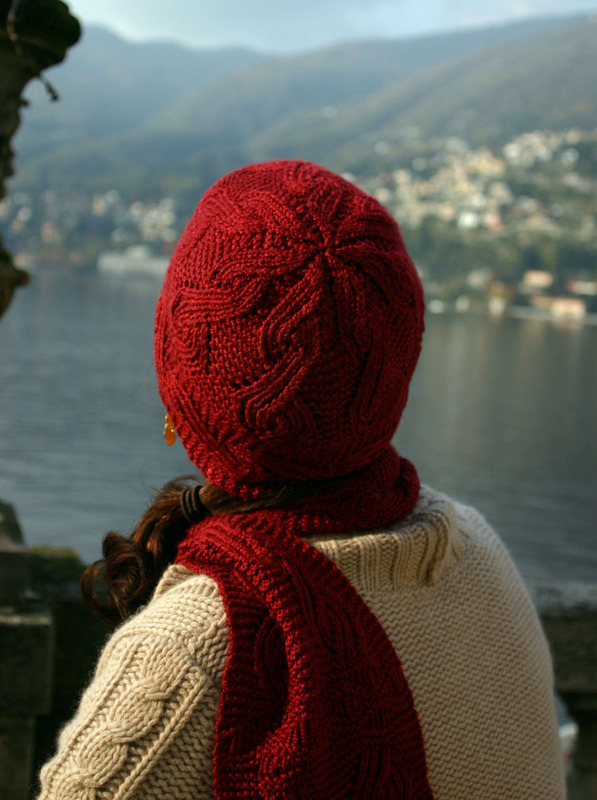 As for my own Magknits patterns, the Cinnabar scarf pattern was already available on my site (and I've now updated the formatting to be more consistent with my self-published designs), and the Rose-of-Sharon hat and purse is now also available in pdf form: just click on the link below. I started to reformat the Seaside glove pattern, and realized that the charts will need to be redrawn; as both gloves are fully charted, this will require a significant amount of time, so I've decided that this pattern (when ready) will not be free, but will cost $3.50. If it's any consolation, I promise that the pattern pdf, and especially the charts, will be clearer and more prettily presented than the Magknits version! Hey, even lichen-locked cherubs need to stay warm. 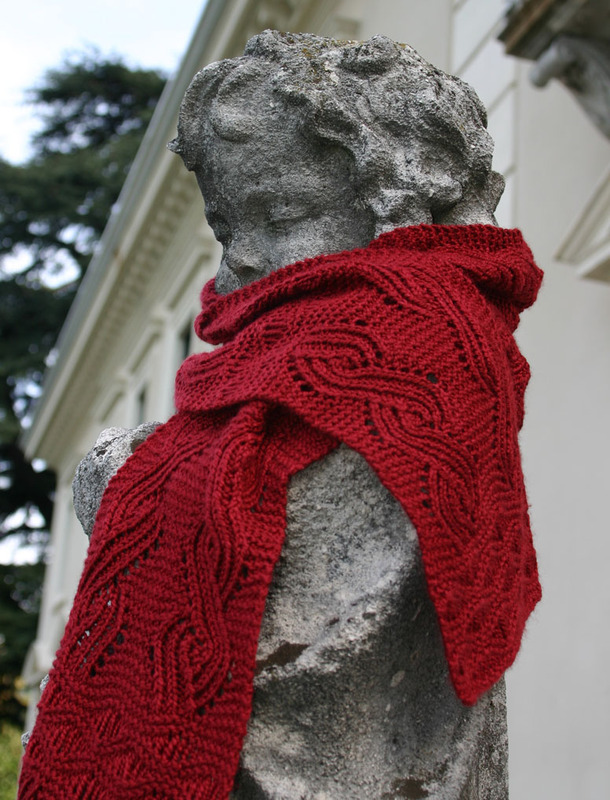 Click the link below to download the Cinnabar Scarf pattern in Adobe Acrobat format. *It's not different, just the corrected version of this. Edited 4/9/08: Magknits is no longer online. Pattern now available! 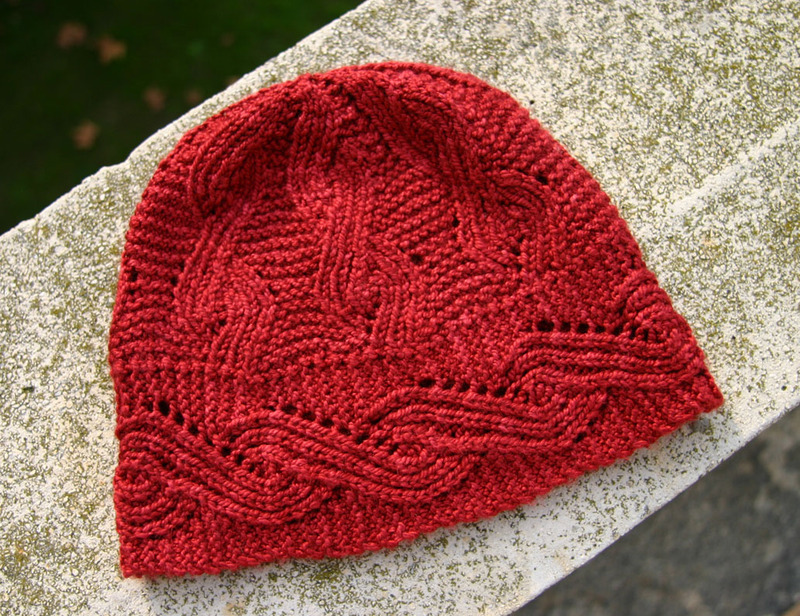 The rich detail and color of carved cinnabar were the inspiration for this hat (for the coordinating scarf pattern, see the December 2006 issue of Magknits). I used a modification of the "Double Ribbed Mock Cable" (DRMC) from Barbara Walker's 4th Treasury of Knitting Patterns. In the pictured hat, the stitch pattern is used both horizontally, for a wide band which wraps around the head, and vertically, from band to crown, but directions are also included for a hat without the horizontal band, which omits the somewhat time-consuming step of picking up stitches along the band. DIFFICULTY: Intermediate; skills include provisional cast-on and grafting (both optional); picking up stitches (for pictured version); increases, decreases and reading chart. MATERIALS: Sundara Yarns hand-dyed DK Silky Merino (50% silk/50% merino wool; 250 yds/229 m per 100 gm skein); #012; 1 skein. Yarn available here; for substitutions try Blue Sky “Alpaca & Silk”; Anny Blatt “Kanpur” (100% silk); Knit Picks “Elegance” (alpaca & silk). Optional: 1 16-inch circular needle, US #5/ 3.75 mm OR SIZE TO OBTAIN GAUGE; smaller needle(s) for picking up stitches along band. Wear one size up for a looser fit; size L hat pictured on size M head. Pattern notes: Directions for provisional cast-on and grafting may be found in Vogue Knitting, the glossary of Interweave Knits, or in a number of other knitting resources. When picking up stitches around band to purl, insert needle through edge stitches from back to front instead of from front to back. 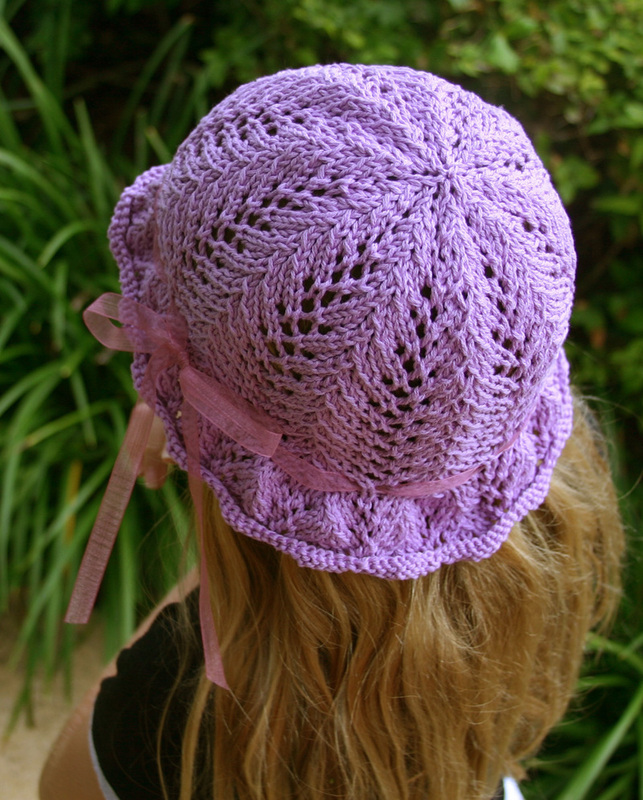 Click here to purchase pattern ($3.50) as an Adobe Acrobat (PDF) file. Edited to add: My test download of the pattern is not working; I'm hoping it's just my slow internet connection, but any purchasers, please let me know if you have any trouble downloading. Edited (again): downloads seem to be working fine--but of course contact me if you have any trouble. Have you seen the December Magknits yet? I finished this hat too late to include in the Cinnabar pattern on Magknits, and I'm still working on the hat pattern, but I hope to finish it soon. I started the hat because I had tried wrapping the scarf around my head during the photo shoot for Magknits, and I liked the way the stitch pattern looked wrapped horizontally. 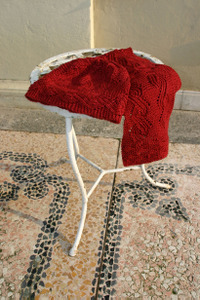 Thanks for the kind words regarding my pattern for the summer 2007 Interweave Knits! The sample is working up quickly (on #8 needles) and I think/hope it will be the kind of thing that you can see, love, buy yarn/dig up yarn from your stash for, and finish in a weekend.